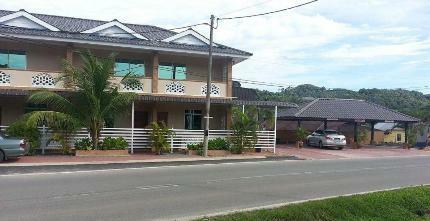 This is a nice small hotel located at southern end of Pantai Cenang area and about 15-20 minute walk from the beach. The two storied hotel is off the busy Cenang beach area offering a quieter ambience although its roadside location can make it a bit noisy at times due to passing traffic but it's tolerable. 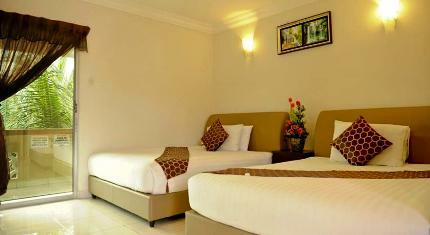 The hotel offers only family rooms each with two queen size beds accommodating four in a room. So if you are in a family, like to be away from the crowded beach area but at the same time enjoy proximity to all the main attractions in Cenang, then this hotel can be a great choice. If you are a couple or single, you will end up paying the full tariff of a four bedded room, unless a discount is offered. There are two types of family rooms (four bedded) in the property - Superior and Deluxe, although the basic in-room amenities are more or less the same. The superior rooms are in the ground floor. All rooms are non-smoking, you can however go out and smoke. The rooms are quite spacious and clean. Each room has two double (queen) beds. Rooms have private balcony with chairs for two, flat screen TV, phone, air-conditioner, fan, in-room electric kettle along with tea/coffee & sugar so that you can make your own tea/coffee. There is a water dispenser kept near the reception area where you can fill up drinking water and it's free. There is also in-room writing desk and wi-fi is available through out the property including in rooms. Although the wifi is good in general, it may slow down or become ineffective at times when there is heavy demand. Bathrooms are nice too and well equipped. Each has shower with geyser which ensures that hot water is available all the time. There is no restaurant in the property. However they do serve simple continental breakfast in a small dining room. The breakfast includes bread, butter, jam, fresh fruits, tea, coffee etc. It's kept on a small table at the dining room so that you can self serve. A water dispenser is kept at the dining room with a provision of both hot and cold water. There is also a convenience store here which is very handy to buy your essentials and even light snack items. If you are beach lover, it is ideal to rent a car because the beach is not very close. Although you can walk to the beach in about 15-20 minutes, on a hot day this could be exhausting. The property also has a small free parking facility with roof cover. It can accommodate about 5 to 6 cars at a time. If you need taxi for pick up or drop, just talk to the reception and they will arrange one for you. Daily maid service is provide to clean the rooms and make the beds. Towels provided. 1) At the time of writing this article, the motel is quite new and very well maintained. The rooms are clean and spacious, all amenities work well. 2) Although the hotel is not on the beach, it's not too far either. You can walk to the beach and many other attractions in Cenang, or if you have a vehicle, the beach is only 2-minute drive. Which means you have easy access to the attractions and at the same time you are able to stay away from the crowded beach area. Several restaurants and eateries are located within walking distance. 3) Staff are nice and friendly. 4) It's a good value for money if you are a family of 3 or 4 because all rooms are 4-bedded. Note that extra beds are not provided in the rooms. 1) The water dispenser is kept near the reception area. If it rains, you will get drenched to refill your bottle because there is no cover or shade on the way to the reception. 2) Not sure why the hotel management requires you to pay the full amount of your stay in advance or while checking in. This is kind of ensuring that you have no choice to change your decision mid-way once you check in. This is usually not the case with hotels of similar category. Cenang Memories Motel is about 20-minute drive from the airport and located at the southern end of Cenang on Jalan Pantai Tengah road, right on the road side.